I fell off the band wagon a little with my 10x10! I've had some work projects come up and felt a little burnt out with the daily posts. I never want this space to feel forced so I try to write when I feel inspired. In the future I may move to summarized posts like this one. This way I can hopefully avoid feeling burnt out during my 10x10 challenge and focus on the outfits/my learnings instead of the actual blog post. But today I wanted to catch all of you up and share my last three looks in my 10x10. So lets get started! 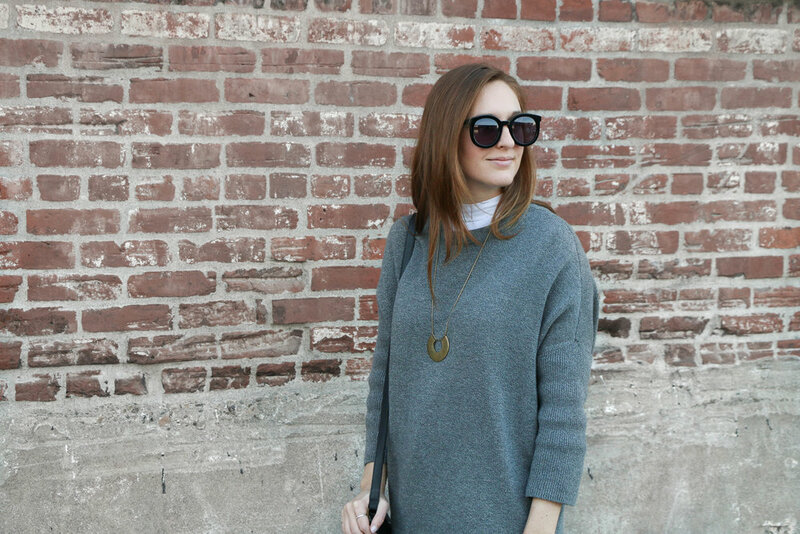 | POP OF EARTH TONE | The olive turtleneck sweater adds a nice warmth to this look. That has been one of my favorite things about playing around with earth tones. Most of my outfits are black, grey or white and the earth tones add a nice warm contrast. It also helps give the outfit a nice center point. | ROLLED SLEEVES | something as simple as rolling your sleeve can add more intrigue to an outfit. It’s a tiny detail but helps to make this look more clean and structured. Rolling the sleeve also mirrors the crop of the pants in this look. A little bit of ankle and a little bit of forearm. This balances the overall look and provides a little relief for the mid afternoon warmth! | BRASS ACCENTS | to further enhance the earth tone in this outfit I relied on my brass jewelry & small brass accents. Brass also adds a lovely warming effect to outfits. I love how the subtle arch necklace ties in with the brass hardware in my bag. Once again small but these details help add cohesiveness to the overall look. | TURTLENECK LAYERING | Layering with a turtleneck is one of my favorite things to do in winter. Instead of opting for the turtleneck piece that comes with the oversized sweater by vetta capsule I went for a white turtleneck to bring a little contrast. | TUNIC SWEATERS | I've been on a hunt for longer sweaters/tunics since last fall & winter. I love how they look when they're layered and the longer silhouette that they create. I'm still on the hunt for more tunics but love styling this one so far! | GREY, WHITE, COGNAC PALETTE | I'm normally a fan of this color scheme but I'm not digging it in this look. I think it is because the balance is off. A little too much grey and needs more white. For me white is what ties cognac and dark grey together and this outfit doesn't have enough white to create that balance. I like the elements but need to work on the color palette! | EARTH TONES | Look at all of those warm colors! I wasn't sure about the olive + cognac combo. I tried this outfit on a bunch of times and kept staring at it then just decided to go with it. Now I think I'm kind of a fan! Without the jacket it is a little much for me but overall I could get used to working with some earth tones. | STRUCTURED TOP + STRUCTURED BOTTOM | Overall this outfit was a bunch of risky moves. One was the color palette and the other was the silhouette. I was a little unsure about pairing a structured long blazer with a cropped wide leg pant. I'm a fan of it though! I was concerned about the long length of the blazer and the crop wide leg conflicting but the heels add a nice height. | TYING IN ELEMENTS | What helps tie this whole look together is the black in the houndstooth blazer and the heels. They are also the dressy components in this look as well. It helps elevate the outfit. I'll be sharing a wrap up post soon and I have a couple of collaborations that I'm super excited to share with all of you so stay tuned!